Pairwise models are commonly used to describe many-species communities. In these models, an individual receives additive fitness effects from pairwise interactions with each species in the community ('additivity assumption'). All pairwise interactions are typically represented by a single equation where parameters reflect signs and strengths of fitness effects ('universality assumption'). Here, we show that a single equation fails to qualitatively capture diverse pairwise microbial interactions. We build mechanistic reference models for two microbial species engaging in commonly-found chemical-mediated interactions, and attempt to derive pairwise models. Different equations are appropriate depending on whether a mediator is consumable or reusable, whether an interaction is mediated by one or more mediators, and sometimes even on quantitative details of the community (e.g. relative fitness of the two species, initial conditions). Our results, combined with potential violation of the additivity assumption in many-species communities, suggest that pairwise modeling will often fail to predict microbial dynamics. From the soil to our body, microbes, such as bacteria, are everywhere and affect us in many ways. Many microbes perform important roles in natural environments and for our health, but some of them can cause harm and lead to diseases. Often, microbes affect and interact with each other within large groups or communities. Because of their widespread ramifications, it is important to understand how microbial communities work. In addition to experiments, mathematical modeling offers one way to gain insight into the dynamics of microbial communities. A model commonly used to describe the interactions between organisms is the so-called ‘pairwise model’. Pairwise models can be useful to predict the dynamics of a community in which two species physically interact, such as a predator-prey community. However, it was unknown if this model was suitable to adequately predict the dynamics of microbial species in communities. Microbes often interact via chemicals that diffuse in the environment. For example, one microbe might provide food for another microbe or release toxins to kill it. However, a pairwise model does not consider food or toxins, but only how one microbe stimulates or inhibits the growth of another. Momeni et al. simulated different scenarios commonly found in microbial communities to test whether a pairwise model could capture how, for example, chemicals released by one bacterial species would either help others to grow or stop them from growing. The results showed that for many scenarios, pairwise models cannot qualitatively represent the dynamics of a microbial community. A next step will be to work on the limitations of current experimental technologies and mathematical models to improve the understanding of microbial communities. This knowledge could be used to develop new strategies for ecosystem engineering, such as for example making soils more fertile to improve crop yields, or tackling antibiotic resistance of bacteria. Multispecies microbial communities are ubiquitous. Microbial communities are important for industrial applications such as cheese and wine fermentation (van Hijum et al., 2013) and municipal waste treatment (Seghezzo et al., 1998). Microbial communities are also important for human health: they can modulate immune responses and food digestion (Round and Mazmanian, 2009; Kau et al., 2011) during health and disease. Properties of the entire community (‘community properties’, e.g. species dynamics, ability to survive internal or external perturbations, and biochemical activities of the entire community) are influenced by interactions wherein individuals alter the physiology of other individuals (Widder et al., 2016). To understand and predict community properties, choosing the appropriate mathematical model to describe species interactions is critical. A mathematical model ideally focuses only on details that are essential to community properties of interest. However, it is often unclear a priori what the minimal essential details are. We define ‘mechanistic models’ as models that explicitly consider interaction mediators as state variables. 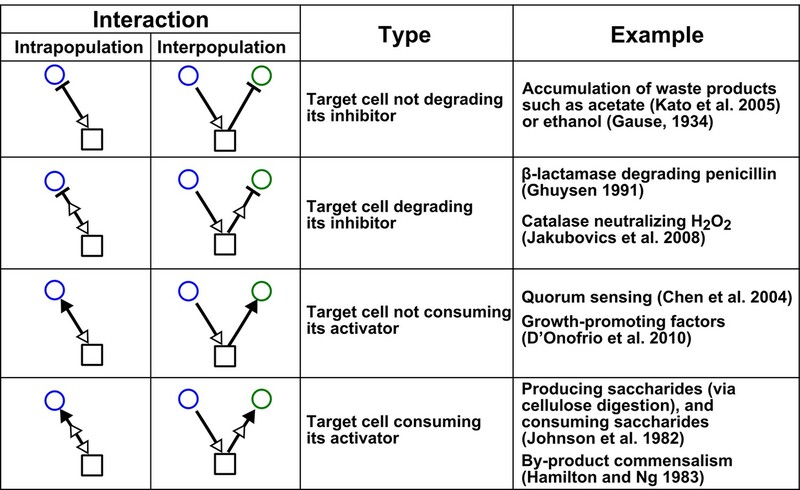 For example, if species S1 releases a compound C1 which stimulates species S2 growth upon consumption by S2, then a mechanistic model tracks concentrations of S1, C1, and S2 (Figure 1A and B, left panels). Note that mechanistic models used here still omit molecular details such as how chemical mediators are received and processed by recipients and how mediators subsequently act on recipients. In contrast, Lotka-Volterra (‘L-V’) pairwise models only consider the fitness effects of interactions. Specifically, L-V models assume that the fitness of an individual is the sum of its basal fitness (the net growth rate of an individual in isolation) and fitness influences from pairwise interactions with individuals of the same species and of every other species in the community (‘additivity’ assumption). Furthermore, regardless of interaction mechanisms or quantitative details of a community, all fitness influences are typically expressed using a single equation form wherein parameters can vary to reflect the signs and magnitudes of fitness influences (‘universality’ assumption). Thus in the example above, a pairwise model only describes how S1 increases the fitness of S2 (Figure 1A and B, right panels). The abstraction of interaction mechanisms in a pairwise model compared to a mechanistic model. (A) The mechanistic model (left) considers a bipartite network of species and chemical interaction mediators. A species can produce or consume chemicals (open arrowheads pointing towards and away from the chemical, respectively). A chemical mediator can positively or negatively influence the fitness of its target species (filled arrowhead and bar, respectively). The corresponding L-V pairwise model (right) includes only the fitness effects of species interactions, which can be positive (filled arrowhead), negative (bar), or zero (line terminus). (B) In the example here, species S1 releases chemical C1, and C1 is consumed by species S2 and promotes S2’s fitness. In the mechanistic model, the three equations respectively state that (1) S1 grows exponentially at a rate r10, (2) C1 is released by S1 at a rate βC1S1 and consumed by S2 with saturable kinetics (maximal consumption rate αC1S2 and half-saturation constant KC1S2), and (3) S2’s growth (basal fitness r20) is influenced by C1 in a saturable fashion. In the pairwise model here, the first equation is identical to that of the mechanistic model. The second equation is similar to the last equation of the mechanistic model except that r21 and K21 together reflect how the density of S1 (S1) affects the fitness of S2 in a saturable fashion. For all parameters with double subscripts, the first subscript denotes the focal species or chemical, and the second subscript denotes the influencer. Note that unlike in mechanistic models, we have omitted ‘S’ from subscripts in pairwise models (e.g. r21 instead of rS2S1) for simplicity. In this example, both r21 and rS2S1 are positive. L-V pairwise models are popular. L-V pairwise modeling has successfully explained the oscillatory dynamics of hare and its predator lynx (Figure 1—figure supplement 1) (Volterra, 1926; Wangersky, 1978; BiologyEOC, 2016). Pairwise models have also been instrumental in delineating conditions for multiple carnivores to coexist when competing for herbivores (MacArthur, 1970; Chesson, 1990). In both cases, mechanistic models and pairwise models happen to be mathematically equivalent for the following reasons. In the hare-lynx example, both species are also interaction mediators, and therefore pairwise and mechanistic models are identical. In the second example, if herbivores (mediators of competitive interactions between carnivores) rapidly reach steady state, herbivores can be mathematically eliminated from the mechanistic model to yield a pairwise model of competing carnivores (MacArthur, 1970; Chesson, 1990). Pairwise models are often used to predict how perturbations to steady-state species composition exacerbate or decline over time (May, 1972; Thébault and Fontaine, 2010; Mougi and Kondoh, 2012; Allesina and Tang, 2012; Suweis et al., 2013; Coyte et al., 2015). Although most work are motivated by contact-dependent prey-predation (e.g. hare-lynx) or mutualisms (e.g. plant-pollinator) where L-V models could be identical to mechanistic models, these work do not explicitly exclude chemical-mediated interactions where species are distinct from interaction mediators. The temptation of using pairwise models is indeed high, including in microbial communities where many interactions are mediated by chemicals (Mounier et al., 2008; Faust and Raes, 2012; Stein et al., 2013; Marino et al., 2014; Coyte et al., 2015). Even though pairwise models do not capture the dynamics of chemical mediators, predicting species dynamics is still highly desirable in, for example, forecasting species diversity and compositional stability. For chemical-mediated interactions, L-V pairwise models are far easier to construct than mechanistic models for the following reasons. Mechanistic models would require knowledge of chemical mediators, which are often challenging to identify. Since chemical mediators are explicitly modeled, mechanistic models require more equations and parameters than their cognate pairwise models (Figure 1, Table). Pairwise model parameters are relatively easy to estimate using community dynamics or dynamics of monocultures and pairwise cocultures (Mounier et al., 2008; Stein et al., 2013; Guo and Boedicker, 2016). Consequently, pairwise modeling has been liberally applied to microbial communities. L-V pairwise models have been criticized when applied to communities of more than two species (referred to as ‘multispecies communities’) (Levine, 1976; Tilman, 1987; Wootton, 1993, 2002; Werner and Peacor, 2003; Stanton, 2003; Schmitz et al., 2004). This is because a third species can influence interactions between a species pair (‘indirect interactions’), which sometimes violates the additivity assumption of pairwise models. For example, a carnivore can indirectly increase the density of a plant by decreasing the density of an herbivore (‘interaction chain’; ‘density-mediated indirect interactions’). A carnivore can also decrease how often an herbivore forages plants (‘interaction modification’, ‘trait-mediated indirect interactions’, or ‘higher order interactions’) (Vandermeer, 1969; Wootton, 1994; Billick and Case, 1994; Wootton, 2002). In interaction modification, foraging per herbivore decreases, whereas in interaction chain, the density of herbivores decreases. Interaction modification (but not interaction chain) violates the additivity assumption (Methods-Interaction modification but not interaction chain violates the additivity assumption) (Tilman, 1987; Wootton, 1994; Schmitz et al., 2004) and can cause the pairwise model to generate qualitatively wrong predictions. Indeed, pairwise models largely failed to predict biomass and species coexistence in three-species and seven-species plant communities (Dormann and Roxburgh, 2005), although reported failures of pairwise models could be due to limitations in data collection and analysis (Case and Bender, 1981; Billick and Case, 1994). Here, we examine the universality assumption of pairwise models when applied to microbial communities (or any community that employs diverse chemical-mediated interactions). Microbes often influence other microbes in a myriad of fashions, via consumable metabolites, reusable signaling molecules, or a combination of chemicals (Figure 2). Can a single equation form, traditionally employed in pairwise models, qualitatively describe diverse interactions between two microbial species? The answer is unclear. On the one hand, pairwise models have been applied successfully to diverse microbial communities. For example, an L-V pairwise model and a mechanistic model both correctly predicted ratio stabilization and spatial intermixing between two strongly-cooperating populations exchanging diffusible essential metabolites (Momeni et al., 2013). 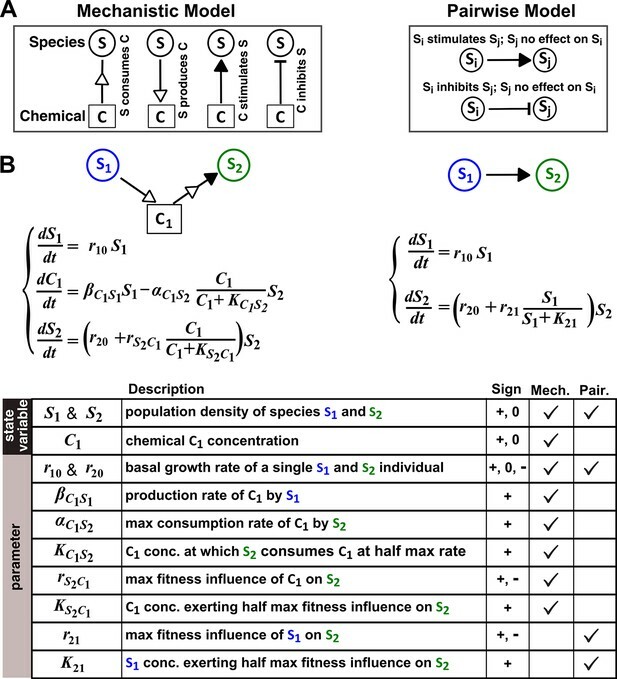 In other examples, pairwise models largely captured competition outcomes and metabolic activities of three-species and four-species artificial microbial communities (Vandermeer, 1969; Guo and Boedicker, 2016; Friedman et al., 2017). On the other hand, pairwise models often failed to predict species coexistence in seven-species microbial communities (Friedman et al., 2017), although this could be due to interaction modification discussed above. Chemical-mediated interactions commonly found in microbial communities. Interactions can be intra- or inter-population. Examples are meant to be illustrative instead of comprehensive. Instead of investigating natural communities where interaction mechanisms can be difficult to identify, we use in silico communities. In these communities, two species interact via mechanisms commonly encountered in microbial communities, including growth-promoting and growth-inhibiting interactions mediated by reusable and consumable compounds (Figure 2) (Stams, 1994; Czárán et al., 2002; Duan et al., 2009). We construct mechanistic models for these two-species communities and attempt to derive from them pairwise models. A mechanistic reference model offers several advantages: community dynamics is deterministically known; deriving a pairwise model is not limited by inaccuracy of experimental methods; and the flexibility in creating different reference models allows us to explore a variety of interaction mechanisms. We demonstrate that a single pairwise equation form often fails for commonly-encountered diverse pairwise microbial interactions. We conclude by discussing when pairwise models might or might not be useful, in light of our findings. Throughout this work, we consider communities grown in a well-mixed environment where all individuals interact with each other with an equal chance. A well-mixed environment can be found in industrial fermenters. Moreover, at a sufficiently small spatial scale, a spatially-structured environment can be approximated as a well-mixed environment, as chemicals are uniformly-distributed locally. Motile organisms also reduce the degree of spatial structure. A well-mixed environment allows us to use ordinary differential equations (ODEs), which are more tractable than partial differential equations demanded by a spatially-structured environment. This in turn allows us to sometimes analytically demonstrate failures of pairwise models. A mechanistic model describes how species release or consume chemicals and how chemicals stimulate or inhibit species growth (Figure 1A left). In contrast, in pairwise models, interation mediators are not explicitly considered (Figure 1A right). Instead, the growth rate of an individual of species Si is the sum of its basal fitness (ri0, net growth rate of the individual in the absence of any intra-species or inter-species interactions) and fitness effects from intra-species and inter-species interactions. The fitness effect from species Sj to species Si is represented by fij(Sj), where Sj is the density of species Sj. fij(Sj) is a linear or nonlinear function of only Sj and not of another species. When j=i, fii(Si) represents density-dependent fitness effect within Si (e.g. density-dependent growth inhibition or stimulation). Here, nonnegative ri0 is the basal fitness of Si; positive Λij is the carrying capacity imposed by limiting shared resource (e.g. space or carbon source) such that a single Si individual will have a zero net growth rate when competing with a total of Λij individuals of Sj. Here, ri0 is the basal fitness of an individual of Si, rij is the maximal fitness effect species Sj can exert on Si, and Kij (>0) is the Sj at which half maximal fitness effect on Si is achieved. ri0 and rij can be positive, negative, or zero. Note that at a low concentration of influencer, the saturable form can be converted to a linear form. Our goal is to test whether a single equation form of pairwise model can qualitatively predict dynamics of species pairs engaging in various types of interactions commonly found in microbial communities (e.g. Figure 2). To do so, we use a combination of analytical and numerical approaches (Figure 1—figure supplement 2). Analytically deriving a pairwise model from a mechanistic model not only reveals assumptions required to generate the pairwise model, but also alleviates any concern that we may have failed to identify the optimal pairwise model parameters. When interactions become more complex (e.g. involving multiple mediators), we take the numerical approach, which is typically used to infer pairwise models from experimental results (Pascual and Kareiva, 1996). In the numerical approach, we mimic experimentalists by first deciding on a pairwise model to be used, and then employing a nonlinear least squares routine to numerically identify model parameters that minimize the average difference D¯ between pairwise and mechanistic model dynamics within a training time window T (Figure 1—figure supplement 2; Methods-Summary of simulation files). To evaluate how well a pairwise model predicts long-term mechanistic model dynamics, we ‘buy time’ by introducing 'dilutions' in numerical simulations of both models and quantify their difference D¯. In this section, we analytically derive pairwise models from mechanistic models of two-species communities where one species affects the other species through a single mediator. The mediator is either reusable such as signaling molecules in quorum sensing (Duan et al., 2009; Jakubovics, 2010) or consumable such as metabolites (Stams, 1994; Freilich et al., 2011) (Figure 2). We show that a single pairwise model may not encompass these different interaction mechanisms and that for consumable mediator, the choice of pairwise model also depends on details such as the relative fitness and initial densities of the two species. Consider a commensal community where species S1 stimulates the growth of species S2 by producing a reusable (Figure 3A) or a consumable (Figure 3B) chemical C1. We consider community dynamics where species are not limited by any abiotic resources, such as within a dilution cycle of a turbidostat experiment where all other metabolites are in excess. Interactions mediated via a single mediator are best represented by different forms of pairwise models, depending on whether the mediator is consumable or reusable and on the relative fitness and initial densities of the two species. S1 stimulates the growth of S2 via a reusable (A) or a consumable (B) chemical C1. In mechanistic models of the two cases (i), equations for S1 and S2 are identical but equations for C1 are different. In (A), C1 can be solved to yield C1=(βC1S1/r10)S10exp⁡(r10t)−(βC1S1/r10)S10=(βC1S1/r10)S1−(βC1S1/r10)S10, assuming zero initial C1. Here, S10 is S1 at time zero. We have approximated C1 by omitting the second term (valid after the initial transient response has passed so that C1 has become proportional to S1). This approximation allows an exact match between the mechanistic model and the saturable L-V pairwise model (ii). In (B), depending on the relative growth rates of the two species, and if additional requirements are satisfied (Methods; Figure 3—figure supplement 2; Figure 3—figure supplement 3; Figure 3—figure supplement 4; Figure 3—figure supplement 5), either saturable L-V or alternative pairwise model should be used. When C1 is reusable, the mechanistic model (Figure 3A,i) can be transformed into a saturable L-V pairwise model (compare Figure 3A,ii with Equation 3), especially after the concentration of the mediator (which is initially zero) has acclimated to be proportional to the producer population size (Figure 3A legend; Figure 3—figure supplement 1). This saturable L-V pairwise model is valid regardless of whether the producer coexists with the consumer, outcompetes the consumer, or is outcompeted by the consumer. If C1 is consumable, different scenarios are possible (Figure 3B; Methods). Case I: When supplier S1 always grows faster than consumer S2 (the basal fitness of S1 is higher than the maximal fitness of S2), C1 will eventually accumulate proportionally to S1 (Figure 4A left; Methods-Deriving a pairwise model for interactions mediated by a single consumable mediator Case I). In this case, C1 may be approximated as a reusable mediator and can be predicted by the saturable L-V pairwise model (Figure 4A right, compare dotted and solid lines). Saturable L-V and alternative pairwise models are not interchangeable. Consider a commensal community with a consumable mediator C1. (A) The mediator accumulates without reaching a steady state within each dilution cycle as the consumer S2 gradually goes extinct (Figure 3B, Case I). After a few tens of generations, C1 becomes proportional to its producer density S1 (inset in left panel). In this case, a saturable L-V (dotted) but not the alternative pairwise model (dashed) is suitable. All parameters are listed in Figure 4—source data 1. (B) The consumable mediator reaches a non-zero steady state within each dilution cycle (Figure 3B, Case II). From mechanistic dynamics where initial species ratio is 1, we use two training windows to derive saturable L-V (dotted) and alternative (dashed) pairwise models. We then use these pairwise models to predict dynamics of communities starting at two different ratios. The alternative model but not the saturable L-V predicts the mechanistic model dynamics. All parameters are listed in Figure 4—source data 2. Note that in all figures, population fractions (instead of population densities) are plotted, which fluctuate less during dilutions compared to mediator concentration. where constants r20, rS2C1, and ω=1−KS2C1/KC1S2 can be positive, negative, or zero, and ψ =(KS2C1αC1S2)/(KC1S2βC1S1) is positive (see Figure 1 table for parameter definitions and see Equation 13 in Methods). We will refer to this equation as ‘alternative pairwise model’, although the fitness influence term is a function of both S1 and S2 instead of the influencer S1 alone as defined in the traditional L-V pairwise model. Case III: When supplier S1 always grows slower than consumer S2, i.e. when the basal fitness of S1 (r10) is less than the basal fitness of S2 (r20), consumable C1 declines to zero concentration. This is because C1 is consumed by S2 whose relative abundance over S1 eventually exponentially increases at a rate of r20−r10. Similar to Case II, under certain conditions (i.e. after community dynamics converges to the f-zero-isocline as seen in Figure 3—figure supplement 2E–H), the alternative pairwise model (Equation 4) can be derived (Methods-Deriving a pairwise model for interactions mediated by a single consumable mediator, Case III). For both Case II and Case III, we analytically demonstrate that in the absence of dilutions, alternative pairwise model dynamics can converge to mechanistic model dynamics (see Figure 3—figure supplements 3 and 5 for initial condition requirement and time scale of convergence). However, if initial S1 and S2 are such that the time scale of convergence is long compared to the duration of one dilution cycle (e.g. Figure 3—figure supplement 2C and G), then we will have to perform dilutions and the saturable L-V model can sometimes be more appropriate than the alternative model (Figure 3—figure supplement 4). Thus in these cases, whether a saturable L-V or an alternative model is more appropriate also depends on initial conditions. if additionally, the half-saturation constant K for C1 consumption (KC1S2) is identical to that for C1’s influence on the growth of consumer (KS2C1), and if S2 has not gone extinct. This equation form has precedence in the literature (e.g. [Mougi and Kondoh, 2012]), where the interaction strength r21 reflects the fact that the consumable mediator from S1 is divided among consumer S2. Thus, we can regard the alternative model (Equation 4) or its simplified version (Equation 5) as a ‘divided influence’ model. The saturable L-V model and the alternative model are not interchangeable (Figure 4). When a consumable mediator accumulates without reaching a steady state within each dilution cycle (Figure 4A left; inset: C1 eventually becomes proportional to S1), the saturable L-V model is predictive of community dynamics (Figure 4A right, compare dotted and solid lines). In contrast, predictions from the alternative pairwise model are qualitatively wrong (Figure 4A right, compare dashed and solid lines). When a consumable mediator eventually reaches a non-zero steady state within each dilution cycle (Figure 4B, black), could a saturable L-V model still work? The saturable L-V model derived from training window i (initial 10 generations) fails to predict species coexistence regardless of initial species ratios (Figure 4B left magenta box, compare solid with dotted). In comparison, the saturable L-V model derived from training window ii (at steady-state species ratio) performs better, especially if the starting species ratio is identical to that of the training dynamics (Figure 4B, top panel in right magenta box). However, at a different starting species ratio, the saturable L-V model fails to predict which species dominates the community (Figure 4B, bottom panel in right magenta box). In contrast, community dynamics can be described by the alternative pairwise model derived from either window i or ii (Figure 4B, compare dashed and solid lines in left and right magenta boxes). We have shown here that even when one species affects another species via a single mediator, either a saturable L-V model or an alternative pairwise model may be appropriate. The appropriate model depends on whether the mediator is reusable or consumable, how fitness of the two species compare, and initial species densities (Figure 3; Figure 3—figure supplements 2–5). Choosing the wrong pairwise model generates qualitatively flawed predictions (Figure 4). Considering that reusable and consumable mediators are both common in microbial interactions, our results call for revisiting the universality assumption of pairwise modeling. A species often affects another species via multiple mediators (Kato et al., 2008; Yang et al., 2009; Traxler et al., 2013; Kim et al., 2013). For example, a fraction of a population might die and release numerous chemicals, and some of these chemicals can simultaneously affect another individual. Here we examine the case where S1 releases two reusable chemicals C1 and C2, both affecting the growth of S2 (Figure 5A). Since the effect of each mediator can be described by a saturable L-V pairwise model (Figure 3A), we ask when the two mediators can be mathematically regarded as one mediator and described by a saturable L-V pairwise model (Figure 5B). An example of a two-mediator interaction where a saturable L-V pairwise model may succeed or fail depending on initial conditions. (A) One species can affect another species via two reusable mediators, each with a different potency KCi where KCi is KS2Cir10/βCiS1 (Methods-Conditions under which a saturable L-V pairwise model can represent one species influencing another via two reusable mediators). A low KCi indicates a strong potency (e.g. high release of Ci by S1 or low Ci required to achieve half-maximal influence on S2). (B) Under what conditions can an interaction via two reusable mediators with saturable effects on recipients be approximated by a saturable L-V pairwise model? (C) A community where the success or failure of a saturable L-V pairwise model depends on initial conditions. Here, KC1= 103 cells/ml and KC2= 105 cells/ml. 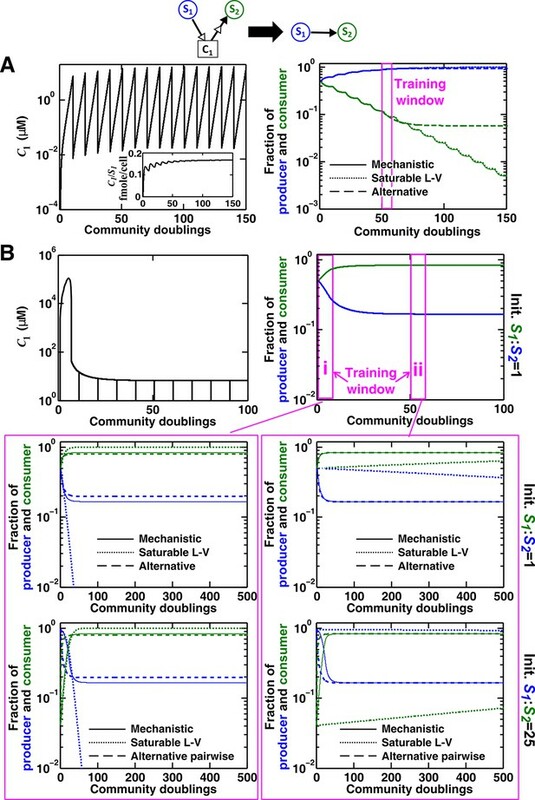 Community dynamics starting at low S1 (solid) can be predicted if the saturable L-V pairwise model is derived from reference dynamics starting at low (dotted). However, if we use a saturable L-V pairwise model derived from a community with high initial S1, prediction is qualitatively wrong (dash dot line). See Figure 5—figure supplement 1D for an explanation why a saturable L-V pairwise model estimated at one community density may not be applicable to another community density. Simulation parameters are listed in Figure 5—source data 1 . We assume that fitness effects from different chemical mediators on a focal species are additive. Not making this assumption will likely violate the additivity assumption essential to pairwise models. Additive fitness effects have been observed for certain ‘homologous’ metabolites. For example, in multi-substrate carbon-limited chemostats of E. coli, the fitness effects from glucose and galactose were additive (Lendenmann and Egli, 1998). ‘Heterologous’ metabolites such as carbon and nitrogen sources likely affect cell fitness in a multiplicative fashion. However, if WC and WN, the fitness influences of released carbon and nitrogen with respect to those already in the environment, are both small (i.e. WC, WN< < 1), the additional relative fitness influence will be additive: (1+WC)(1+WN)−1≈WC+WN. However, we need to keep in mind that even among homologous metabolites, fitness effects may not be additive (Hermsen et al., 2015). ‘Sequential’ metabolites (e.g. diauxic shift) provide another example of non-additivity. Similar to the previous section, we assume that all abiotic resources are unlimited. For the two reusable mediators, depending on their relative ‘potency’ (defined in Figure 5A legend), their combined effect generally cannot be modeled as a single mediator except under special conditions (Methods-Conditions under which a saturable L-V pairwise model can represent one species influencing another via two reusable mediators). These special conditions include: (1) mediators share similar potency (Figure 5—figure supplement 1B), or (2) one mediator dominates the interaction (Figure 5—figure supplement 1C). If these conditions are not satisfied, we can easily find examples where saturable L-V pairwise models derived from a low-density community and from a high-density community have qualitatively different parameters (Figure 5—figure supplement 1D). Consequently, the future dynamics of a low-density community can be predicted by a saturable L-V model derived from a low-density community but not by a model derived from a high-density community (Figure 5C). Thus, even though each mediator can be modeled by saturable L-V, their joint effects may or may not be modeled by saturable L-V depending on the relative potencies of the two mediators and sometimes even on initial conditions (high or low initial S1). Similarly, when both mediators are consumable and do not accumulate (as in Cases II and III of Figure 3B), the fitness effect term becomes rS2C1S1ωC1S1+ψC1S2+rS2C2S1ωC2S1+ψC2S2. Except under special conditions (e.g. when ωC1 and ωC2 are zero, or when ωC1/ωC2=ψC1/ψC2, or when one mediator dominates the interaction), the two mediators may not be regarded as one. By the same token, when one mediator is a steady-state consumable and the other is reusable, they generally may not be regarded as a single mediator and would require yet a different pairwise model (i.e. with the fitness effect term rS2C1S1ωC1S1+ψC1S2+rS2C2S1S1+KS2C2r10/βC2S1). In summary, when S1 influences S2 through multiple mediators, rarely can we approximate them as a single mediator. Sometimes, a pairwise model derived from one community may not apply to communities initiated at different densities (Figure 5C; Figure 5—figure supplement 1D). This casts further doubt on the usefulness of a single pairwise model for all pairwise microbial interactions. So far, by assuming that abiotic resources are always present in excess (e.g. in turbidostats), we have not considered species competition for abiotic resources. In this section, we consider a competitive commensal community in a batch environment where S1 and S2 compete for an essential shared resource C1 supplied by the environment at a constant rate (e.g. constant light), and S1 supplies an essential consumable metabolite C2 to promote S2 growth (Figure 6A, left). We show that an L-V pairwise model works for some but not all communities even though these communities qualitatively share the same interaction mechanism. An example of a competitive commensal community where an L-V pairwise model may work or fail. (A) Left: Two species S1 and S2 compete for shared resource C1. Additionally, S1 produces C2 that promotes the growth of S2 upon consumption. Right: An L-V pairwise model captures the intra- and inter-species competition as well as the commensal interaction between the two species. (B,C) Examples where L-V pairwise models predict the mechanistic reference dynamics well. (D) An example where the L-V pairwise model fails to predict the dynamics qualitatively (note the much longer time range). Here, population fractions fluctuate due to changes in relative concentration of C1 compared to C2. In all cases, the pairwise model is derived from the population dynamics in the initial stages of growth (150 hr in all cases). Simulation parameters are listed in Figure 6—source data 1. In our mechanistic model (Methods-Competitive commensal interaction, Equation 47), the fitness of S2 is multiplicatively affected by C1 and C2 (Mankad and Bungay, 1988). We choose parameters such that the effect from C2 to S2 is far from saturation (e.g. linear with respect to C2 and S1) to simplify the problem. In our L-V pairwise model (Figure 6A, right; Methods-Competitive commensal interaction, Equation 48), intra- and inter-species competition is represented by the traditional logistic L-V model (Equation 2; Gause, 1934; Thébault and Fontaine, 2010; Mougi and Kondoh, 2012). We then introduce a linear term (r21S1) to describe the fitness effect of commensal interaction. We tested various sets of mechanistic model parameters where the two species coexist in a steady fashion (Figure 6B), or one species goes extinct (Figure 6C), or species composition fluctuates (Figure 6D). L-V pairwise models deduced from a fixed period of training time could predict future dynamics in the first two cases, but failed to do so in the third case. Thus, depending on dynamic details of communities, a pairwise model sometimes works and sometimes fails. To summarize our work, even for pairwise microbial interactions, depending on interaction mechanisms (reusable versus consumable mediator, single mediator versus multiple mediators), we will need to use a plethora of pairwise models to avoid qualitative failures in predicting which species dominates a community or whether species coexist (Figures 3, 4 and 5). Sometimes, even when different communities share identical interaction mechanisms, depending on details such as relative species fitness, interaction strength, and initial conditions, the best-fitting pairwise model may or may not predict future dynamics (Figure 3B, Figure 3—figure supplement 4, Figure 4, Figure 5, Figure 5—figure supplement 1, and Figure 6). 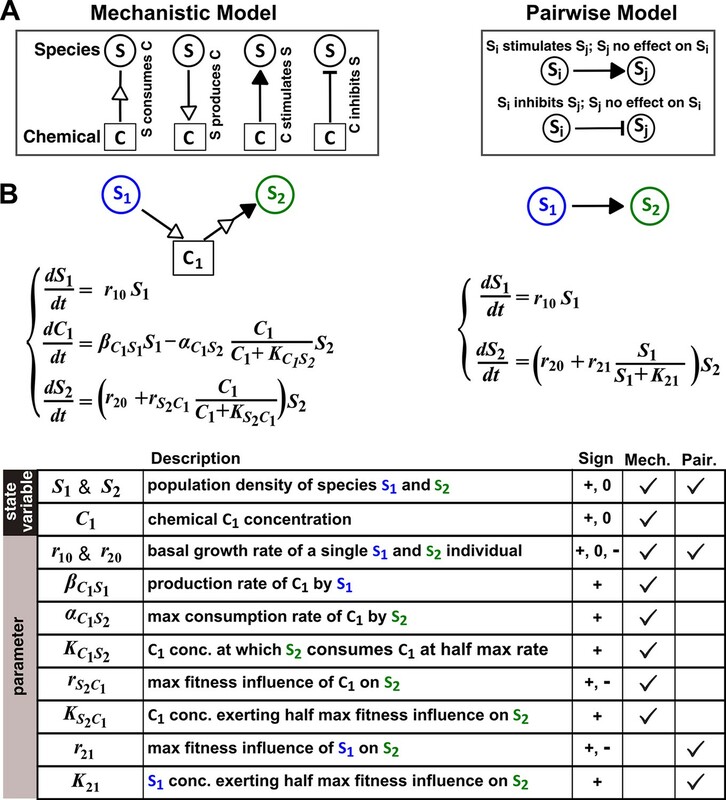 This defeats the very purpose of pairwise modeling – using a single equation form to capture fitness effects of all pairwise species interactions regardless of interaction mechanisms or quantitative details. In a community of more than two microbial species, interaction modification can cause pairwise models to fail (Figure 7). Even if species interact in an interaction chain and thus interaction modification does not occur, various chain segments may require different forms of pairwise models. 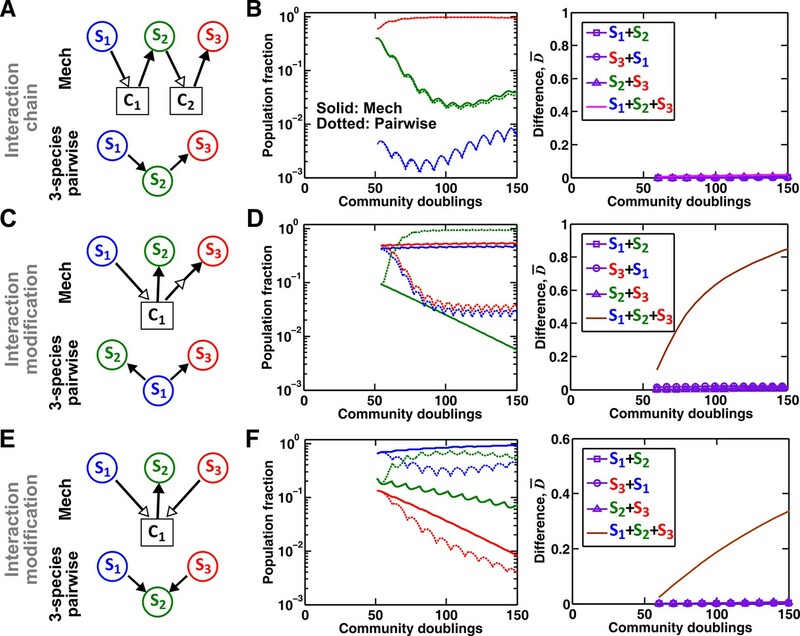 Taken together, a pairwise model is unlikely to be effective for predicting community dynamics especially if interaction mechanisms are diverse. Interaction chain but not interaction modification may be represented by a multispecies pairwise model. We examine three-species communities engaging in indirect interactions. Each species pair is representable by a two-species pairwise model (saturable L-V or alternative pairwise model, purple in the right columns of B, D, and F). We then use these two-species pairwise models to construct a three-species pairwise model, and test how well it predicts the dynamics known from the mechanistic model. In B, D, and F, left panels show dynamics from the mechanistic models (solid lines) and three-species pairwise models (dotted lines). Right panels show the difference metric D¯. (A–B) Interaction chain: S1 affects S2, and S2 affects S3. The two interactions employ independent mediators C1 and C2, and both interactions can be represented by the saturable L-V pairwise model. The three-species pairwise model matches the mechanistic model in this case. Simulation parameters are provided in Figure 7—source data 1. (C–F) Interaction modification. In both cases, the three-species pairwise model fails to predict reference dynamics even though the dynamics of each species pair can be represented by a pairwise model. (C–D) S3 consumes C1, a mediator by which S1 stimulates S2. Parameters are listed in Figure 7—source data 2. Here, S1 changes the nature of interaction between S2 and S3: S2 and S3 do not interact in the absence of S1, but S3 inhibits S2 in the presence of S1. The three-species pairwise model makes qualitatively wrong prediction about species coexistence. As expected, if S3 does not remove C1, the three-species pairwise model works (Figure 7—figure supplement 1A–B). (E–F) S1 and S3 both supply C1 which stimulates S2. Here, no species changes ‘the nature of interactions’ between any other two species: both S1 and S3 contribute reusable C1 to stimulate S2. S1 promotes S2 regardless of S3; S3 promotes S2 regardless of S1; S1 and S3 do not interact regardless of S2. However, a multispecies pairwise model assumes that the fitness effects from the two producers on S2 will be additive, whereas in reality, the fitness effect on S2 saturates at high . As a result, the three-species pairwise model qualitatively fails to capture relative species abundance. As expected, if C1 affects S2 in a linear fashion, the community dynamics is accurately captured in the multispecies pairwise model (Figure 7—figure supplement 1C–D). Simulation parameters are listed in Figure 7—source data 3. Multispecies pairwise models are widely used in theoretical ecology due to their simplicity. These models assume that all pairwise species interactions can be captured by a single pairwise model regardless of interaction mechanisms or quantitative details of a community (universality assumption). This assumption may be satisfied if, for example, interaction mediators are always species themselves (e.g. prey-predation in a food web) so that pairwise models are equivalent to mechanistic models. However, interactions in microbial communities are diverse and often mediated by chemicals (Figure 2). Here, we consider the validity of universality assumption of pairwise models in well-mixed, two-species microbial communities. We have focused on various types of chemical-mediated interactions commonly encountered in microbial communities (Figure 2) (Kato et al., 2005; Gause, 1934; Ghuysen, 1991; Jakubovics et al., 2008; Chen et al., 2004; D'Onofrio et al., 2010; Johnson et al., 1982; Hamilton and Ng, 1983). For each type of species interaction, we construct a mechanistic model to generate reference community dynamics (akin to experimental results). We then attempt to derive the best-matching pairwise model and ask how predictive it is. We first consider cases where abiotic resources are in excess. 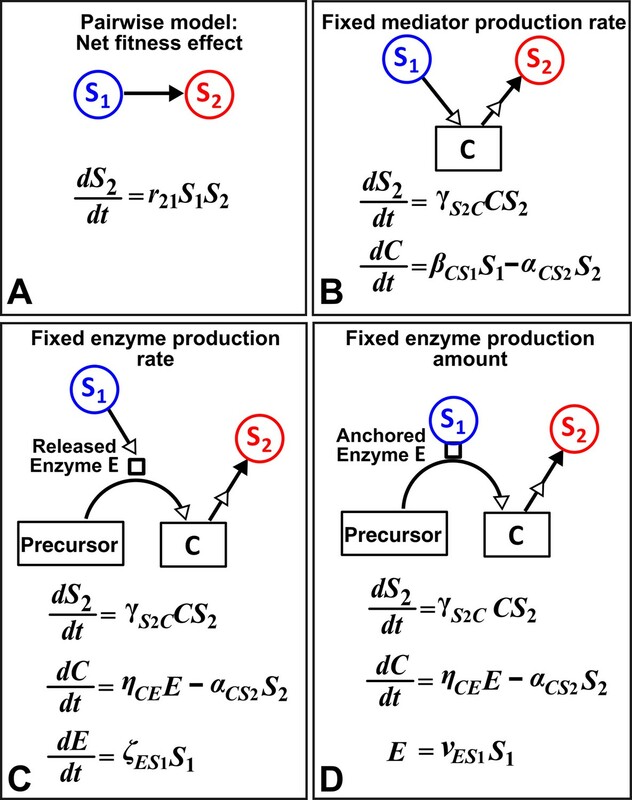 When one species affects another species via a single chemical mediator, either the saturable L-V or the alternative pairwise model is appropriate, depending on the interaction mechanism (consumable versus reusable mediator), relative fitness of the two species, and initial conditions (Figure 3; Figure 3—figure supplement 2 to Figure 3—figure supplement 5). These two models are not interchangeable (Figure 4). If one species influences another species through multiple mediators, then in general, these mediators may not be regarded as a single mediator nor representable by a single pairwise model. For example, for two reusable mediators, unless their potencies are similar or one mediator is much more potent than the other, saturable L-V model parameters can qualitatively differ depending on initial community density (Figure 5—figure supplement 1D). Consequently, a pairwise model derived from a high-density community generates false predictions for low-density communities (Figure 5C), limiting the usefulness of pairwise models. We then consider a community where two species compete for a shared resource while engaging in commensalism via a single chemical mediator. We find that the best-fitting L-V pairwise model can predict future dynamics in some but not all communities, depending on parameters used in the mechanistic model (Figure 6). Thus, although a single equation form can work in many cases, it generates qualitatively wrong predictions in many other cases. In communities of more than two microbial species, indirect interactions via a third species can occur. When indirect interactions take the form of interaction chains, if each chain segment of two species engages in an independent interaction and can be represented by a pairwise model, then multispecies pairwise models can work (Figure 7A-B). However, as discussed above, pairwise equation forms may vary among chain segments depending on interaction mechanisms and quantitative details of a community. When indirect interactions take the form of interaction modification, even if each species pair can be accurately represented by a pairwise model, a multispecies pairwise model may fail (Figure 7C–F, ). Interaction modification includes trait modification (Wootton, 2002; Werner and Peacor, 2003; Schmitz et al., 2004), or, in our cases, mediator modification. Mediator modification is very common in microbial communities. For example, antibiotic released by one species to inhibit another species may be inactivated by a third species, and this type of indirect interactions can stabilize microbial communities (Kelsic et al., 2015; Bairey et al., 2016). As another example, interaction mediators are often generated by and shared among multiple species. For example in oral biofilms, organic acids such as lactic acid are generated from carbohydrate fermentation by many species (Bradshaw et al., 1994; Marsh and Bradshaw, 1997; Kuramitsu et al., 2007). Such by-products are also consumed by multiple species (Kolenbrander, 2000). One can argue that an extended pairwise model (e.g. dS2dt=r20S2+rS2CS1ς+ωS1+ψS2S2) embodying both the saturable form and the alternative form can serve as a general-purpose model at least for pairwise interactions via a single mediator. In fact, even the effects of indirect interactions may be quantified and included in the model by incorporating higher-order interaction terms (Case and Bender, 1981; Worthen and Moore, 1991), although with many challenges (Wootton, 2002). In the end, although these strategies may lead to a sufficiently accurate phenomenological model especially within the training window, they may fail to predict future dynamics. When might a pairwise model be useful? First, pairwise models have been instrumental in understanding ecological phenomena such as prey-predator oscillatory dynamics and coexistence of competing predator species (Volterra, 1926; MacArthur, 1970; Case and Casten, 1979; Chesson, 1990). In these cases, mechanistic models are either identical to pairwise models or can be transformed into pairwise models under simplifying assumptions. Second, pairwise models of pairwise species interactions can provide a bird’s-eye view of strong or weak stimulatory or inhibitory interactions in a community. For example, Vetsigian et al., 2011 found that interactions between soil-isolated Streptomyces strains are enriched for reciprocity – if A inhibits or promotes B, it is likely that B also inhibits or promotes A (Vetsigian et al., 2011). Third, pairwise models have been useful in qualitatively understanding species assembly rules in small communities (Friedman et al., 2017). That is, qualitative information regarding species survival in competitions among a small number of species may be used to predict survival in more diverse communities within a similar time window. Fourth, a pairwise model can serve as a starting point for generating hypotheses on species interactions (e.g. Li et al., 2015). 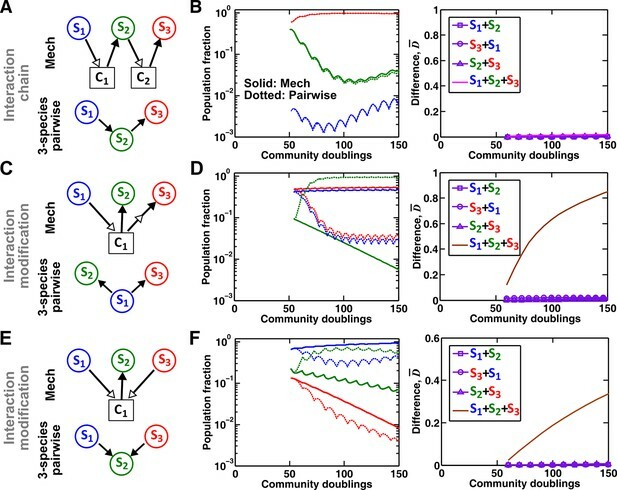 Note that when applied to microbial communities (Mounier et al., 2008; Stein et al., 2013; Marino et al., 2014), a fitting pairwise model means that the training dynamics of the community under investigation can be approximated by a theoretical community where species interactions satisfy the additivity and universality assumptions of pairwise models. Even though the theoretical community is likely different from the real community, hypothesis formulation can still be valuable. Finally, pairwise models can be useful in making predictions of limited scales. For example, Stein et al. used 2/3 of community dynamics data as a training set to derive a multispecies pairwise model, and in the best-case scenario, the model generated reasonable predictions on the remaining 1/3 of data (Stein et al., 2013). However, as we have shown, pairwise models can generate qualitatively wrong predictions (Figures 4–7), especially if interaction mechanisms are diverse such as in microbial communities. Not surprisingly, predicting qualitative consequences of species removal or addition using a pairwise model has encountered difficulties, especially in communities of more than three species (Mounier et al., 2008; Friedman et al., 2017). An alternative to a pairwise model is a mechanistic model. How much information about interaction mechanisms do we need to construct a mechanistic model? That is, what is the proper level of abstraction which captures the phenomena of interest, yet avoids unnecessary details (Li et al., 2015; Durrett and Levin, 1994)? For example, Tilman argued that if a small number of mechanisms (e.g. the ‘axes of trade-offs’ in species traits) could explain much of the observed pattern (e.g. species coexistence), then this abstraction would be highly revealing (Tilman, 1987). However, the choice of abstraction is often not obvious. Consider for example a commensal community where S1 grows exponentially (not explicitly depicted in equations in Figure 8) and the net growth rate of S2, which is normally zero, is promoted by mediator C from S1 in a linear fashion (Figure 8). If we do not know how S1 stimulates S2, we can still construct an L-V pairwise model (Figure 8A). If we know the identity of mediator C and realize that C is consumable, then we can instead construct a mechanistic model incorporating C (Figure 8B). However, if C is produced from a precursor via an enzyme E released by S1, then we get a different form of mechanistic model (Figure 8C). If, on the other hand, E is anchored on the membrane of S1 and each cell expresses a similar amount of E, then equations in Figure 8D are mathematically equivalent to Figure 8B. This simple example, inspired by extracellular breakdown of cellulose into a consumable sugar C (Bayer and Lamed, 1986; Felix and Ljungdahl, 1993; Schwarz, 2001), illustrates how knowledge of mechanisms may eventually help us determine the right level of abstraction. Different levels of abstraction in a mechanistic model. How one species (S1) may influence another (S2) can be mechanistically modeled at different levels of abstraction. For simplicity, here we assume that interaction strength scales in a linear (instead of saturable) fashion with respect to mediator concentration or species density. The basal fitness of S2 is zero. (A) In the simplest form, S1 stimulates S2 in an L-V pairwise model. (B) In a mechanistic model, we may realize that S1 stimulates S2 via a mediator C which is consumed by S2. The corresponding mechanistic model is given. (C) Upon probing more deeply, it may become clear that S1 stimulates S2 via an enzyme E, where E degrades an abundant precursor (such as cellulose) to generate mediator C (such as glucose). In the corresponding mechanistic model, we may assume that E is released by S1 at a rate ζES1 and that E liberates C at a rate ηCE. (D) If instead E is anchored on the cell surface (e.g. cellulosome), then E is proportional to S1. If we substitute E into the second equation, then (B) and (D) become equivalent. Thus, when enzyme is anchored on cell surface but not when enzyme is released, the mechanistic knowledge of enzyme can be neglected. In summary, under certain circumstances, we may already know that microbial interaction mechanisms fall within the domain of validity for a particular pairwise model. In these cases, a pairwise model provides the appropriate level of abstraction, and constructing such a pairwise model is much easier than a mechanistic model (Figure 1). However, if we do not know whether a pairwise model is valid, we will need to be cautious since pairwise models can fail to even qualitatively capture pairwise microbial interactions. We need to be equally careful when extrapolating and generalizing conclusions obtained from pairwise models, especially for communities where species interaction mechanisms are diverse. Considering recent advances in identifying and quantifying interactions, we advocate a transition to models that incorporate interaction mechanisms at the appropriate level of abstraction. Here, fij(Sj) describes how Sj, the density of species Sj, positively or negatively affects the fitness of Si, and is a linear or nonlinear function of only Sj. does not violate the additivity assumption (compare with Equation 6 (Case and Bender, 1981; Wootton, 1994). The second type of indirect interactions is known as ‘interaction modification’ or ‘trait-mediated indirect interactions’ or ‘higher order interactions’ (Vandermeer, 1969; Wootton, 1994; Billick and Case, 1994; Wootton, 2002), where a third species modifies the ‘nature of interaction’ from one species to another (Wootton, 2002; Werner and Peacor, 2003; Schmitz et al., 2004). For example, when carnivore is present, herbivore will spend less time foraging and consequently plant density increases. In this case, f12 in Equation 7 is a function of both S2 and S3, violating the additivity assumption. Step 1: Identify monoculture parameters ri0, rii, and Kii (Figure 1—figure supplement 2C, Row 1 and Row 2). Step 2: Identify interaction parameters rij, rji, Kij, and Kji where i≠j (Figure 1—figure supplement 2C, Row 3). Step 3: Calculate distance D¯ between population dynamics of the reference mechanistic model and the approximate pairwise model over a period of time outside of the training window to assess if the pairwise model is predictive. To facilitate mathematical analysis, we assume that requirements calculated below are eventually satisfied within each dilution cycle (see Figure 3—figure supplement 4 for an example where dilution cycles necessitated by long convergence time violate requirements for a pairwise model to converge to the mechanistic model). We further assume that r10>0 and r20>0 so that species cannot go extinct in the absence of dilution. See Figure 3—figure supplement 5 for a summary of this section. Let C1(t=0)=C10=0; S1(t=0)=S10; and S2(t=0)=S20. Note that the initial condition C10=0 can be easily imposed experimentally by pre-washing cells. Under which conditions can we eliminate C1 so that we can obtain a pairwise model of S1 and S2? Define RS=S2/S1 as the ratio of the two populations. Since producer S1 always grows faster than consumer S2, RS→0 as t→∞. Define C~1=C1/S1 (‘~' indicating scaling against a function). Thus for t≫ln⁡(αC1S2RS(0)βC1S1)/|r20+rS2C1−r10|, dC~1dt≈βC1S1−r10C~1. When initial C1~ is 0, this equation can be solved to yield: C1~≈βC1S1(1−exp⁡(−r10t))/r10. After time of the order of 1/r10, the second term can be neglected. Thus, C1~≈βC1S1/r10 after time of the order of max(ln⁡(αC1S2RS(0)βC1S1)/|r20+rS2C1−r10|,1/r10). Then C1 can be replaced by (βC1S1/r10)S1 in Equation 8, and a saturable L-V pairwise model can be derived. For Equation 8, we find that a steady state solution for C1 and RS, denoted respectively as C1∗ and RS∗, exist. They can be easily found by setting the growth rates of S1 and S2 to be equal, and dC1/dt to zero. where ω and ψ are constants (Figure 3Bii). For certain conditions (which will be discussed at the end of this section, Figure 3—figure supplement 5A), this alternative model can make reasonable predictions of community dynamics even before the community reaches the steady state (Figure 4Bii , compare dashed and solid lines). Below we discuss the general properties of community dynamics and show that there exists a time scale tf after which it is reasonable to assume f≈0 and the alternative model can be derived. We also estimate tf for several scenarios. defines the f-zero-isocline on the C^1−R^s phase plane (i.e. values of (C^1,\ R^S) at which f(C^1,R^S)=0 and thus C^1 can be eliminated to obtain a pairwise model; Figure 3—figure supplement 2A–D blue lines). As shown in Figure 3—figure supplement 2A, the phase portrait is divided into four regions by the f-zero-isocline (blue) and the steady state C^1=1 (vertical solid line), and grey arrows dictate the direction of the community dynamics trajectory (C^1, R^S). Starting from 'initial state' (C^1(t=0)=0, R^S(t=0)), the trajectory moves downward right (brown circles and orange lines in Figure 3—figure supplement 2A–D) until it hits C^1=1. Then, it moves upward right and eventually hits the f-zero-isocline. Afterward, the trajectory moves toward the steady state (green circles) very closely along (and not superimposing) the f-zero-isocline during which the alternative pairwise model can be derived (Figure 3—figure supplement 2A–D). It is difficult to solve Equations 14 and 15 analytically because the detailed community dynamics depends on the parameters and the initial species composition in a complicated way. However, under certain initial conditions, we can estimate tf, the time scale for the community to approach the f-zero-isocline. Note that tf is not a precise value. Instead it estimates the acclimation time scale after which a pairwise model can be derived. One assumption used when estimating all tf is that S10 is sufficiently high (Figure 3—figure supplement 5B) to avoid the long lag phase that is otherwise required for the mediator to accumulate to a high enough concentration. This is plotted as a black dotted line in Figure 3—figure supplement 2A–D. From Equation 11, this becomes RS(0)/RS∗≫max(1,r10−r20r20+rS2C1−r10). According to the condition, R̂S(0)≫ max(1,K̂S2C1−1). If K̂S2C1−1>1, then R̂S(0)≫K̂S2C1−1, R̂S(0)K̂S2C1≫1 and K^S2C1<1. To calculate the time it takes for the trajectory to reach the f-zero-isocline, let ΔsC^1=C^1−1 and ΔsR^S=R^S−1 at any time point t respectively represent deviation of (C^1(t), R^S(t)) away from their steady state values of (1, 1). We can thus linearize Equation 14 and Equation 15 around the steady state. Note that since at the steady state f= 0, thus Δsf=f. At steady state, dR^Sdt=h(1,1)=0. Thus, r20+rS2C11+K^S2C1−r10=0. the community is sufficiently close to f-zero-isocline. During tf1, C^1 increases from 0 to 1. Thus, 1≈β^C1S1S1(0)r10(er10tf1−1). tf1≈ln⁡(r10/(β^C1S1S10)+1)/r10. From Equation 9, dRS/dt>0. From Equation 8, below the f-zero-isocline, dC1/dt>0 and above the f-zero-isocline, dC1/dt<0. Thus if the system starts from (0,RS(0)), the phase portrait dictates that it moves with a positive slope until a time of a scale tf when it hits the f-zero-isocline, after which it moves upward to the left closely along the f-zero-isocline (Figure 3—figure supplement 2E). After tf, the alternative pairwise model can be derived. Although tf is difficult to estimate in general, it is possible for the following cases. Below, we plot Equation 43 under different parameters (Figure 3—figure supplement 3) to reveal conditions for convergence between mechanistic and pairwise models. Case II (rS2C1>r10−r20>0): steady state RS∗ exists for mechanistic model. If ω=1−KS2C1/KC1S2≥0 (Figure 3—figure supplement 3A): When RS<RS∗, dRS/dt is positive. When RS>RS∗, dRS/dt is negative. Thus, wherever the initial RS, it will always converge toward the only steady state RS∗ of the mechanistic model. Case III (r10<r20): RS increases exponentially in mechanistic model (Equation 9). Thus, C1 will decline toward zero as C1 is consumed by S2 whose relative abundance over S1 exponentially increases. Hence, according to Equation 9, RS eventually increases exponentially at a rate of r20−r10. If ω≥0 (Figure 3—figure supplement 3C): Equation 43 dRSdt=(r20+rS2C1ω+ψRS−r10)RS>0. Thus, Equation 43, which is based on alternative pairwise model, also predicts that RS will eventually increase exponentially at a rate of r20−r10, similar to the mechanistic model. If ω<0 (Figure 3—figure supplement 3D): RS(0)>−ω/ψ (Equation 44) is required for unbounded increase in RS (similar to the mechanistic model). Otherwise, RS converges to an erroneous value instead. can be a good approximation. D¯ can be close to zero when (i) KC1≈KC2 or (ii) rS2C1S1S1+KC1 and rS2C2S1S1+KC2(effects of C1 and C2 on S2) differ dramatically in magnitude. For (ii), without loss of generality, suppose that the effect of C2 on S2 can be neglected. This can be achieved if (iia) rS2C2 is much smaller than rS2C1, or (iib) KC2 is large compared to S1. Here, S1 and S2 are the densities of the two species; ri0 is the basal net growth rate of Si (negative, representing death in the absence of the essential shared resource C1); C1 is supplied at a constant rate β0; βC2S1is the production rate of C2 by S1; αCiSj is the amount of resource Ci consumed to produce a new Sj cell. which is the standard Monod equation. A similar argument holds for limiting C2. We have intentionally chosen very large KS2C2 to ensure that the fitness effect of C2 on S2 is linear with respect to C2. This way, we minimize the number of pairwise model parameters that need to be estimated. When Λi>0 (i.e. when bi0>di), this resembles standard L-V model traditionally used for competitive interactions (compare to Equation 2; Gause, 1934; Thébault and Fontaine, 2010; Mougi and Kondoh, 2012). Here, birth rate of each species is reduced by competition from the two species, and Λij is the carrying capacity such that a single Si individual will have a zero birth rate when encountering a total of Λij individuals of Sj. For S2, We used (b20+r21S1)(1−S1Λ21−S2Λ22)S2 instead of b20(1−S1Λ21−S2Λ22)S2+r21S1S2 so that when the shared resource is exhausted (i.e. 1−S1Λ21−S2Λ22=0), S2 does not keep growing due to the presence of S1. Higher order interactions in Ecological Communities: what are they and how can they be detected? Proceedings of the Royal Society B: Biological Sciences 272:1279–1285. Annual Review of Microbiology 47:791–819. Nature Ecology & Evolution 1:0109. Annual Review of Microbiology 45:37–67. Methods in Molecular Biology 1151:209–231. Applied and Environmental Microbiology 43:1125–1132. Applied and Environmental Microbiology 71:7099–7106. Annual Review of Microbiology 54:413–437. Microbiology and Molecular Biology Reviews 71:653–670. 421–431, The Strategy of Model Building in Population Biology, American Scientist, 54. Which games are growing bacterial populations playing? Journal of the Royal Society, Interface 12:20150121. Advances in Dental Research 11:176–185. Will a large complex system be stable? Applied and Environmental Microbiology 74:172–181. Applied Microbiology and Biotechnology 56:634–649. Current Opinion in Biotechnology 24:178–186. Journal Du Conseil Conseil Permanent International Pour Exploration De La Mer 1931:3–51. Annual Review of Ecology and Systematics 9:189–218. Annual Review of Ecology and Systematics 25:443–466. Journal of Sea Research 48:157–172. Thank you for submitting your work entitled "The validity of pairwise models in predicting community dynamics" for consideration by eLife. Your article has been reviewed by two peer reviewers, and the evaluation has been overseen by a Reviewing Editor, Bruce R. Levin, and a Senior Editor. The reviewers have opted to remain anonymous. This review and editorial decision, has two elements. Part 1 has been put together by the Reviewing editor but is the product of a discussion between the editor and the reviewers. Part 2 are the separate comments and suggestions of the reviewers. There is a fair amount of overlap. BRL agrees with all of the critical comments and suggestions of the reviewers. Following our discussion, BRL sent the first part of this recommendation to the reviewers. Save for a typo, they approved of this collective review and recommendation. The subject of this report is right on. In addition to the considerable industrial and ecological and medical interest in bacterial communities, thanks to the "microbiome mania" the need to understand the processes that determine and maintain the structure of these communities has become increasingly important. Central to acquiring this understanding will doubtless be mathematical and/or computer simulations models of the population and evolutionary dynamics of bacteria and the interactions between these populations and the physical, chemical and biotic factors that determine their densities and relative frequencies in communities. How to construct and analyze the properties of these models is not at all clear at this time; the long-standing fissure between population and community ecology has yet to be breached. This report considers the problems of modeling bacterial populations and communities. As trendy and important as this subject is, we don't consider this report to be of sufficient general interest to be published in ELife. Although it may be of interest to some theoreticians, we believe it would be of little interest and utility to population and evolutionary biologists and biometricians doing experimental or other empirical research with bacteria and bacterial communities. It is too abstract and doesn't address specific questions. Some readers may also see it as a complex, equation illustrated rant telling them what they already know about the limitations of pairwise models. We believe it would be more suitable for a fine but more specialized journal like PLoS Computational Biology, where the readers will be more attune to mathematical modeling of the sort considered in this report. 1) – We agree with the George Box adage, "All models are wrong, some are useful". However, we don't see how their pairwise models would be useful for understanding the processes that determine "distribution and abundance" of bacterial strains and species in communities. To be sure, even without understanding the mechanisms responsible, it would be useful to be able to predict the distribution and abundance of species from empirical estimates of the parameter of these "pairwise" models. But as we see this report as a cautionary tale saying that it is unlikely that pairwise models will be able to achieve these ends much beyond three species and if that. Moreover, even if it were possible to provide predictive pairwise models for specific simple communities, perhaps the macrobiotic of yogurt, there would be little or no generality, like to cheese or bread starters, much less natural communities. 2) Arguably (not to BRL) mechanistic models are most useful when they are wrong, when there are substantial qualitative rather than just small quantitative differences between the predictions of the model and observations in the empirical studies. That way one knows that there are fundamental errors in the biological, chemical and environmental assumptions upon which the model was based. In the best of cases, a wrong mechanistic model will point to the biological and other assumptions that have to be modified to obtain a better fit and thereby increase our understanding of the mechanisms responsible for the phenomenon under study. It is not clear how the pairwise models of the sort they are considering could achieve this end when they fit or don't fit. 3) What one means by a "mechanistic model" and mechanisms in general is in the eyes, mind and perspective of the beholder. The authors can do a better job of providing the readers with a clear distinction between what they mean by pairwise rather than mechanistic models. They present the logistic model and its extensions, like the Gause competition models, as pairwise rather than mechanistic models. We agree, but some may not. These models make the reasonable assumption that the rate of growth of populations decline as they approach the point of saturation of the environment, the parameter K. But the authors and most others interpret that parameter to reflect resource limitation, which seems mechanistic albeit not explicit in the model. Moreover, the ecological nature of the equilibrium in Logistic models and its extensions is not defined. Is that equilibrium, K, the density at stationary phase in batch culture? Or is the population at equilibrium in an environment in which resources are continually made available and bacteria and wastes are continually being removed, like a chemostat or turbidostat? 4) There is a real need to develop models that deal with the inconvenient reality of the physical structure of real habitats of bacteria. The ODE mechanistic and pairwise models considered in this report do not address this reality, which doubtless contributes to the distribution and abundance of species and strains of bacteria in natural communities. In this work, the authors study the validity of utilizing phenomenological models of pairwise interactions to describe the dynamics of ecological communities. To do so, they employ theory and simulations to compare the dynamics of detailed mechanistic models to the ones of appropriately parameterized pairwise models. 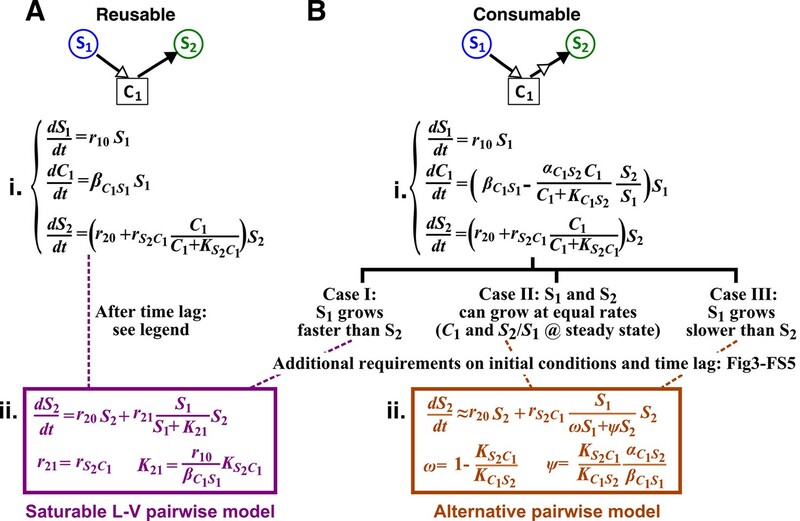 Improving our understanding of the capabilities and limitations of pairwise models is an important and timely goal, especially given their recent popularity in modeling microbial communities. I also appreciate the authors' approach of trying to delineate the types of mechanistic situations in which the pairwise approximation is valid. However, the aspects of the problem that the authors focused on are not always the ones I feel are the most interesting and useful. Specifically, the authors focused on identifying situations in which a specific pairwise model can provide an exact description of the community dynamics. It is not surprising that phenomenological pairwise models often fail to capture exactly the dynamics of more complex mechanistic models. Nonetheless, there may be many situations where they are still useful, either by providing approximate description of the dynamics, or by capturing important qualitative features, such as the existence of oscillations, the set of coexisting species, presence of alternative stable states, etc. To me, understanding the conditions under which pairwise models are not even approximately correct, or make qualitatively wrong prediction is one of the important outstanding challenges in community modeling. I would encourage the authors to use their approach to provide insight into these questions, but, at the very least, they should clarify the difference between different failures of pairwise models. Additionally, they should be more explicit about cases in which no pairwise model would capture the community dynamics (e.g. in cases of interaction modification, or higher order interaction), versus ones in which the pairwise model that was considered wasn't adequate, but there may be a different one that is. The authors also do not consider cases where interactions are mediated by externally supplied, abiotic mediators, rather than ones produced by the species themselves. The author's model is an extension of MacArthur's competition model, whose link to pairwise models have been extensively studied (e.g. Chesson, P. "MacArthur's Consumer Resource Model." Theoretical Population Biology 37, no. 1 (1990): 2638.). What is not captured is competition of abiotic resources, such as the models common in David Tilman's work. The authors should make these distinctions clear, and put their work in the context of previous work. I also believe that extending the work to include competition for abiotic resources would add significant value to the work. The work of Momeni et al. "The validity of pairwise models in predicting community dynamics" explores conditions under which mechanistic models of species interacting via chemical mediators can be reduced to pairwise models. Pairwise models do not require a full mechanistic understanding of the nature of interactions within the community and thus use fewer parameters, which is why they are often used. The authors report that in many cases, pairwise models fail to predict, quantitatively or qualitatively, the dynamics of many species communities, which is why they should be used with caution. The authors do a good job in exploring the various scenarios under which pairwise models are not sufficient to capture these dynamics. A point that deserves more attention however is how these results are immediately relevant for past and future studies of microbial communities? The authors provide references to several studies that employed pairwise models to simulate community dynamics. However, many of those do not model chemically mediated interactions, but rather direct interactions, such as the predator prey examples mentioned in the introduction and are thus not directly relevant to what is studied here. Can the authors provide more specific examples of works that employ pairwise models to model chemically mediated interactions? The authors clearly describe several regimes under which pairwise models fail. However, to identify whether the community being modeled falls into these regimes, one often needs to have a quite detailed mechanistic understanding of the interactions within the community in the first place. What would then be the advantages of using a pairwise model, given that this information is available? Also, it is not clear if this is an exhaustive list of regimes that they look at or are there other regimes out there to be explored? Thus, we are left with a conundrum that the work does not address: why the results are useful for systems where we do not know all the details of the interactions? In general, for dynamical systems it is not at all surprising that 'the devil is in the details' of interactions for many a system, as weak couplings can often have important roles. Especially for systems that are under evolutionary pressure I can see how small couplings can be essential. Thus, models with underdetermined number of parameters will often fail, especially as long as the main state variables of a system are unknown, or when these tend to shift in importance from system to system. Thus, to me the strong 'punch' in the message of the paper is missing, especially for a wider audience outside of the ecology crowd. As a reviewer I am part of this outside audience I am not an ecologist nor am I a theorist. As trendy and important as this subject is, we don't consider this report to be of sufficient general interest to be published in eLife. Although it may be of interest to some theoreticians, we believe it would be of little interest and utility to population and evolutionary biologists and biometricians doing experimental or other empirical research with bacteria and bacterial communities. The famous quote of George Box (“All models are wrong, some are useful”) reflects the need to omit less important details and focus on important aspects of a system when constructing a model. This quote creates a dilemma for experimentalists: how would they decide which models are sufficiently useful? Their fears are legitimate: although all models are wrong, there are different reasons for being “wrong”. Certain models are “wrong” because details (e.g. the precise values of parameters) are off. Other models are wrong because the fundamental assumptions are wrong (e.g. blending inheritance). The first class can still yield insightful information that transcends details (e.g. the famous L-V pairwise model capturing the oscillatory dynamics of predator-prey communities). We presume that this is the reason why theoretical papers are still being written and some of them are still published in high-profile journals. Given the complexity of microbial communities, the temptation of using simple pairwise modeling by “biologists and biometricians doing experimental or other empirical research with bacteria and bacterial communities” is in fact strong (see Introduction, fourth paragraph). Thus, our work is directly relevant to people who work on microbial communities. It is too abstract and doesn't address specific questions. Some readers may also see it as a complex, equation illustrated rant telling them what they already know about the limitations of pairwise models. We believe it would be more suitable for a fine but more specialized journal like PLoS Computational Biology, where the readers will be more attune to mathematical modeling of the sort considered in this report. The specific question we have addressed is “Can we use a single equation form to represent diverse pairwise microbial interactions, as done in multispecies pairwise modeling?” The answer is “No”, as elaborated in Figures 3–6. This fundamental flaw we have uncovered is orthogonal to the known limitation of pairwise modeling (i.e. modification of pairwise interactions by a third species). To our knowledge, our findings have not been discussed in the literature. This is a major contribution, given the popularity and intellectual impact of pairwise models. From reading reviewers’ comments, we realize that our writing may have been too abstract. Thus, we have reduced the use of equations in the main text (only keeping the essential ones) and have relegated most of our mathematical derivations to Methods so that general readers don’t have to read them, but for those who might be interested, the information is readily available. To demonstrate success or failure of pairwise modeling, we have replaced abstract figures of parameter comparisons with easier-to-read figures of population composition dynamics. Finally, since it is already known that interaction modification by a third species undermines multi-species pairwise modeling, we have cut down descriptions on this and moved it (Figure 7) from Results to Discussion. 1) We agree with the George Box adage, "All models are wrong, some are useful". However, we don't see how their pairwise models would be useful for understanding the processes that determine "distribution and abundance" of bacterial strains and species in communities. We are arguing the opposite: pairwise models are not as useful as one might hope when applied to microbial communities and should be used and interpreted with great caution. To be sure, even without understanding the mechanisms responsible, it would be useful to be able to predict the distribution and abundance of species from empirical estimates of the parameter of these "pairwise" models. But as we see this report as a cautionary tale saying that it is unlikely that pairwise models will be able to achieve these ends much beyond three species and if that. As stated above, we argue that a single equation form, which is the standard of practice in pairwise modeling, often fails even for two-species microbial communities. Moreover, even if it were possible to provide predictive pairwise models for specific simple communities, perhaps the macrobiotic of yogurt, there would be little or no generality, like to cheese or bread starters, much less natural communities. The possible lack of generality among different communities does not negate the importance of being able to understand communities of interest. 3) What one means by a "mechanistic model" and mechanisms in general is in the eyes, mind and perspective of the beholder. The authors can do a better job of providing the readers with a clear distinction between what they mean by pairwise rather than mechanistic models. They present the logistic model and its extensions, like the Gause competition models, as pairwise rather than mechanistic models. We agree, but some may not. These models make the reasonable assumption that the rate of growth of populations decline as they approach the point of saturation of the environment, the parameter K. But the authors and most others interpret that parameter to reflect resource limitation, which seems mechanistic albeit not explicit in the model. Moreover, the ecological nature of the equilibrium in Logistic models and its extensions is not defined. Is that equilibrium, K, the density at stationary phase in batch culture? Or is the population at equilibrium in an environment in which resources are continually made available and bacteria and wastes are continually being removed, like a chemostat or turbidostat? In our definition, the logistic model is not considered mechanistic because it does not model interaction mediators (the limiting metabolite). We agree that the logistic model can nicely capture resource competition, as shown by Gause. To clarify (Figure 1 table), in our mechanistic model, parameter KSCis the concentration of mediator C where half maximal fitness effect on recipient species S is achieved. In our pairwise model, parameter Kijis the density of the interaction-initiating species Sjwhere half maximal fitness effect on recipient species Siis achieved. Communities in our original manuscript were grown in a turbidostat so that no metabolites other than interaction mediators were limiting. We intentionally did so to avoid introducing additional mediators and additional parameters. However, as per reviewer 1’s request, we have added an example where two species in a batch environment compete for an abiotic metabolite while simultaneously engaging in commensalism (Figure 6). We show that although a logistic L-V pairwise model can work in some cases, it generates wrong predictions in other cases, depending on parameter choices of the mechanistic model. If a model fails to capture microbial interactions in a well-mixed environment, a spatially-structured environment is unlikely to rescue this failure. However, the aspects of the problem that the authors focused on are not always the ones I feel are the most interesting and useful. Specifically, the authors focused on identifying situations in which a specific pairwise model can provide an exact description of the community dynamics. It is not surprising that phenomenological pairwise models often fail to capture exactly the dynamics of more complex mechanistic models. Our writing did at times create the impression that we were only interested in exact matches, but this is not our intention. Figures 4, 5, 6 and 7, and Figure 3—figure supplement 4 now demonstrate qualitative failures of using a single pairwise equation form to describe diverse pairwise microbial interactions and diverse details of microbial communities. We have also revised our writing in Results to clarify our intention. Our goal is to test whether a single form of pairwise model can qualitatively predict dynamics of species pairs engaging in various types of interactions commonly found in microbial communities (e.g. Figure 2). “We first consider cases where abiotic resources are in excess. When one species affects another species via a single chemical mediator, either saturable L-V or alternative pairwise model is appropriate, depending on interaction mechanism (consumable versus reusable mediator), relative fitness of the two species, and initial conditions (Figure 3; Figure 3—figure supplement 2 to Figure 3—figure supplement 5). […] Thus, although a single equation form can work in many cases, it generates qualitatively wrong predictions in many other cases. Nonetheless, there may be many situations where they are still useful, either by providing approximate description of the dynamics, or by capturing important qualitative features, such as the existence of oscillations, the set of coexisting species, presence of alternative stable states, etc. “L-V pairwise models are popular. L-V pairwise modeling has successfully explained the oscillatory dynamics of hare and its predator lynx (Figure 1—figure supplement 1) (Volterra 1926; Wangersky 1978; “BiologyEOC – PopulationChanges” 2016). […] In the second example, if herbivores (mediators of competitive interactions between carnivores) rapidly reach steady state, herbivores can be mathematically eliminated from the mechanistic model to yield a pairwise model of competing carnivores (MacArthur 1970; Chesson 1990). To me, understanding the conditions under which pairwise models are not even approximately correct, or make qualitatively wrong prediction is one of the important outstanding challenges in community modeling. I would encourage the authors to use their approach to provide insight into these questions, but, at the very least, they should clarify the difference between different failures of pairwise models. Additionally, they should be more explicit about cases in which no pairwise model would capture the community dynamics (e.g. in cases of interaction modification, or higher order interaction), versus ones in which the pairwise model that was considered wasn't adequate, but there may be a different one that is. We have re-organized our text so that in the Discussion, we recap the two failure reasons of pairwise modeling: i) Interaction modification/higher order interactions in communities of three or more species violate the additivity assumption (this is previously known; Figure 7). In this case, even if each pairwise species interaction can be described by a pairwise model, the multispecies pairwise model will fail. ii) A single equation form cannot describe diverse pairwise interactions between microbes, thus violating the universality assumption (this is the focus of our paper; Figures 3, 4, 5 and 6). Originally, we intentionally left out the influence of external nutrients (e.g. competition for abiotic resources) so that we could focus on interactions mediated by a single chemical. If failure of pairwise modeling is established in these simpler cases, then our conclusion on the limitation of pairwise modeling is already valid. Nevertheless, we have now added a section on two species competing for an abiotic resource while engaging in a commensal interaction. Again, we observed that depending on parameter choices of the mechanistic model, the best-fitting pairwise model would work in some communities, but fail in other communities (Figure 6). The work of Momeni et al. "The validity of pairwise models in predicting community dynamics" explores conditions under which mechanistic models of species interacting via chemical mediators can be reduced to pairwise models. Pairwise models do not require a full mechanistic understanding of the nature of interactions within the community and thus use fewer parameters, which is why they are often used. The authors report that in many cases, pairwise models fail to predict, quantitatively or qualitatively, the dynamics of many species communities, which is why they should be used with caution. Our focus is not “many-species communities.” Instead, we show that a single pairwise equation form (as used in pairwise modeling) cannot capture diverse pairwise chemical-mediated microbial interactions. Please see the last paragraph of the Results. The authors do a good job in exploring the various scenarios under which pairwise models are not sufficient to capture these dynamics. A point that deserves more attention however is how these results are immediately relevant for past and future studies of microbial communities? As per reviewer 1’s request, we have also added an example where two species compete for an abiotic resource while engaging in a commensal interaction. Again, we find that a pairwise model sometimes works but sometimes fails (Figure 6). Given the ubiquity of various interaction mechanisms that we consider in our work, our results are immediately relevant for studies of microbial communities. The authors provide references to several studies that employed pairwise models to simulate community dynamics. However, many of those do not model chemically mediated interactions, but rather direct interactions, such as the predator prey examples mentioned in the introduction and are thus not directly relevant to what is studied here. This paper models density-dependent self-inhibition for each species (aii< 0), and positive or negative inter-species interactions (aij). The work is abstract, with no mentioning of particular interaction mechanisms. This work examines two types of networks: trophic (all interactions are +/-) and mutualistic (all interactions are +/+). For both cases, a logistic L-V form is used for intra-species competition and a saturable L-V form is used for the effect of inter-species interactions. Aside from pest-plant and plant-pollinator images to illustrate trophic and mutualistic interactions, there is no mentioning that such model may not be applied to interactions where interaction mediators are distinct from species themselves. This work argues that studies on purely mutualistic or purely trophic networks may not be adequate and examines communities with both types of interactions. The model is fairly general, with one assumption that distinguishes it from previous models: "with a biologically feasible assumption that interaction strengths decrease with increasing resource species, due to an allocation of interacting effort". This makes it closer to our alternative model (Eq. 5). The work does not mention that such models can fail for microbial communities when interactions are mediated by chemicals. This works uses the same framework as May, but examines what would happen when interactions are mostly trophic or mostly mutualistic (or a mix), and when more realistic network structures are imposed. They broadly speak of ecological networks, without mentioning specific mechanisms that are valid or not valid. This work examines mutualistic communities (mentioning plant-animal interactions in their motivations). This work uses two types of equations: Holling Type I (linear L-V, similar to May's equations) and Holling Type II (nonlinear, similar to (Thebault and Fontaine, 2010) or the saturable L-V). Beyond occasionally mentioning plant-animals (as an example of cooperation), they don't delve into which interaction mechanisms are valid or invalid. This paper specifically mentions human gut microbiome as their motivation and as examples throughout. They use equations similar to May's for their analysis. We do not intend to undermine these works by suggesting that they should have made this distinction clear. However, without an explicit analysis such as offered by this work, pairwise models have been applied liberally to any, including microbial, communities where interaction mediators are chemicals and not species. Can the authors provide more specific examples of works that employ pairwise models to model chemically mediated interactions? Coyte, K.Z., Schluter, J., and Foster, K.R. (2015). The ecology of the microbiome: Networks, competition, and stability. Science 350, 663–666. Faust, K., and Raes, J. (2012). Microbial interactions: from networks to models. Nat. Rev. Microbiol. 10, 538–550. Marino, S., Baxter, N.T., Huffnagle, G.B., Petrosino, J.F., and Schloss, P.D. (2014). Mathematical modeling of primary succession of murine intestinal microbiota. Proc. Natl. Acad. Sci. 111, 439–444. Mounier, J., Monnet, C., Vallaeys, T., Arditi, R., Sarthou, A.-S., Hélias, A., and Irlinger, F. (2008). Microbial interactions within a cheese microbial community. Appl. Environ. Microbiol. 74, 172–181. Stein, R.R., Bucci, V., Toussaint, N.C., Buffie, C.G., Rätsch, G., Pamer, E.G., Sander, C., and Xavier, J.B. (2013). Ecological Modeling from Time-Series Inference: Insight into Dynamics and Stability of Intestinal Microbiota. PLoS Comput Biol 9, e1003388. The authors clearly describe several regimes under which pairwise models fail. However, to identify whether the community being modeled falls into these regimes, one often needs to have a quite detailed mechanistic understanding of the interactions within the community in the first place. What would then be the advantages of using a pairwise model, given that this information is available? Also, it is not clear if this is an exhaustive list of regimes that they look at or are there other regimes out there to be explored? Thus, we are left with a conundrum that the work does not address: why the results are useful for systems where we do not know all the details of the interactions? You are right in that models with underdetermined number of parameters and state variables unsurprisingly fail (although we provide as many cases where they work as cases where they fail to work, see Figures 3, 4, 5, 6 and 7). According to this view, then no pairwise modeling paper should be published. However, the reality is that these papers are published in high-profile general-audience journals and that pairwise model remains one of the most popular tools in theoretical ecology. To our knowledge, our finding (a single pairwise model cannot describe diverse pairwise microbial interactions) has not been discussed in the literature. “One man’s trivial is another man’s fundamental”, although here we are not talking about “another man” but many other men! Our work points out a fundamental flaw in arguably one of the most influential models in ecology when applied to microbial communities, and thus deserves to be in a high-profile, general-audience journal. © 2017, Momeni et al.